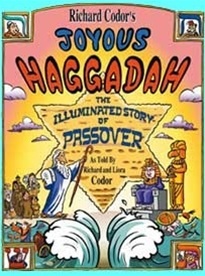 A delightful Cartoon Haggadah for children and people who spend Passover with children. A concise haggadah that does NOT abbreviate the fun! It's chock full of cartoon drawings on its covers and on every page. There is a Moses cartoon strip, a map that shows how the Israelites got into Egypt and a double page Exodus spread that shows how they got out. The Four Children are instant classics as are the Frogs, Locusts, Vermin and all the other Plagues and there's also the best Chad Gadya ever. And if that's not enough, there are so many little drawings hidden in the borders, that we can't count them all.